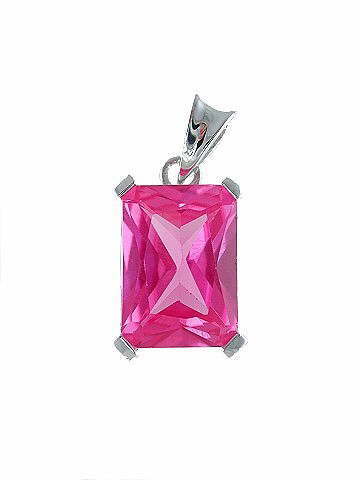 Exquisite emerald-cut, vibrant coloured, Pink Sapphire pendant set in Rhodium-plated 925 sterling silver. This pendant is far brighter than it appears in the photo and is full of energy, clarity and sparkle! This is a real Pink Sapphire which is lab-grown. Genuine Pink Sapphire Crystals are collected and then grown in controlled conditions in a laboratory. This process produces completely flawless, pure pink Sapphire crystals. Despite these crystals being grown in a lab, they still possess the same metaphysical vibrations as natural specimens.